Sony's modest success with the RX100 has attracted all the other sharks swimming in the pool that keeps getting smaller. Today Fujifilm introduced it's answer, the XQ1. First, a comment about what's being chased here: what all serious photographers desire is a high-quality camera they can slip into a shirt pocket (or small purse). We have to go all the way back into the film era and the Olympus XA for the first real example that started the trend. Just as happened as happened after Olympus had success with the XA, we're now seeing competitors pop up chasing Sony's recent RX100. Even Sony quickly updated the RX100 in order to try to keep its advantage, adding a slightly better sensor, a tilting LCD, and external EVF support. 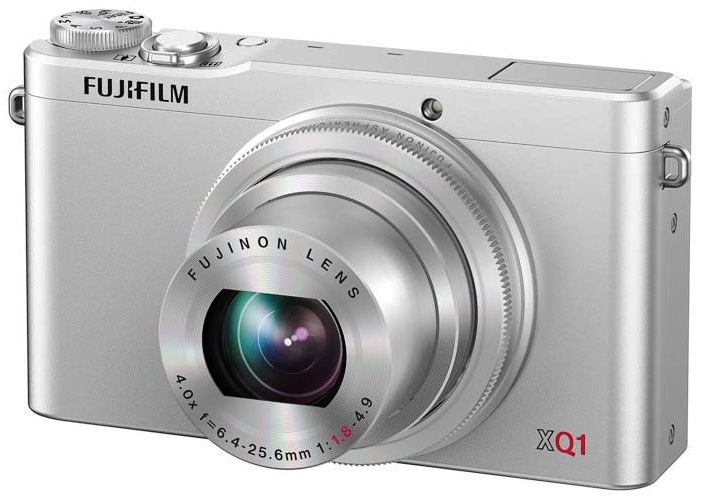 Fujifilm's XQ1, therefore, is the latest in the high-quality shirt pocket camera competitors. It uses the same 12mp X-Trans sensor as their X20 (remember this is 2.3" sensor, so a bit smaller than the Sony's), and sticks a 25-100mm f/1.8-4.9 (equivalent) lens up front. Unlike the Sony, Fujifilm has on-sensor phase detect capability that Fujifilm's confused marketing department claims is the "world's fastest AF." Funny thing is, that same marketing department claimed the X-E2 was the world's fastest on the same day. Let's see: X-E2 focuses in 0.08 seconds, the XQ1 in 0.06. Fujifilm's footnotes don't help illuminate just how they're going about making these competing claims. Suffice it to say that the XQ1 has speedy focus compared to compact cameras of yore. The camera is small (3.9 x 2.3 x 1.3", or 100x58.5x33.3mm for my foreign readers) and light (7.3 ounces, or 206g). The battery is claimed to reach 240 shots under CIPA standard testing. The camera is US$500, which undercuts the RX100, so the chase is on folks.